The wait is finally over! The most lovely couple of Tollywood officially changed their status to ‘engaged’. 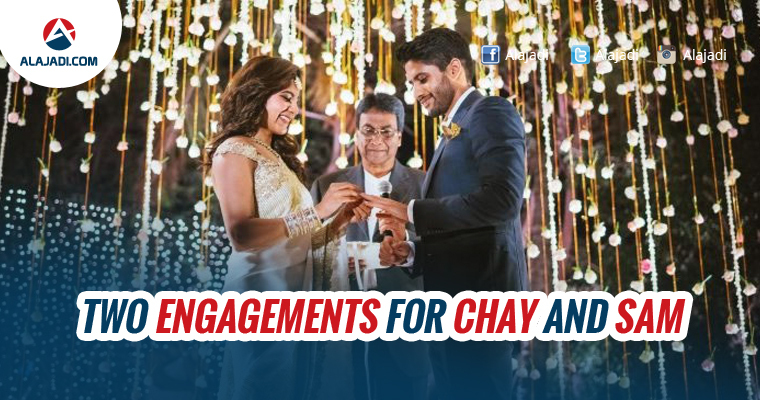 After being in a relationship for last few months, the Naga Chaitanya-Samantha couple exchanged the rings yesterday. India is perhaps the only secular country in the world where religions and cultures dance in democracy. In many other countries, marrying a person from another religion needs a religious conversion as well, but Hamara Bharat is different altogether in this aspect. Other day, star heroine Samantha Ruth Prabhu, a Christian by birth, has got engaged to her longtime beau and Tollywood’s charming star Naga Chaitanya, a Hindu by birth. Guess what, these two have got engaged in both Christian and Hindu traditions. While Sam’s father Mr Prabhu along with another Church head have done prayers, before she adored the ring on bridegroom’s finger, later traditional Hindu ‘veda mantralu’ are recited to confirm the unification of the couple as per Telugu traditions. These are the sights only you can see in India, and it’s really pleasure to see these big stars respecting each other’s religion this way. Meanwhile we’re hearing that there will be two weddings as well for #ChaiSam, one including a grand Christian wedding at a vintage church in Chennai where Samantha always dreamt of getting married there. Also another Goa venue is also on the list of couple for the same Christian wedding in case if guest accommodation turns little issue in Chennai city. Later Chay will be tying the sacred Mangalsutra at a ceremony in Hyderabad which will be a closely guarded one, while the Reception will also takes place in the Telangana capital only. For now wedding dates aren’t yet decided. In a event confined to close friends and family of Akkineni’s, the Ye Maaya Chesave pair engaged as per both Hindu and Christian traditions. Also, for the first time, actor Nagarjuna took to twitter to announce their engagement : #Chaisam It’s official now. My mother is my daughter now. Couldn’t be happier!! Whereas Akhil reposted his dad’s tweeted by captioning, My brother and my new sister ! I’m the happiest thammudu in the world. Love you guys !